Summary Dual-drive Marvell-based NAS with USB 3.0 ports, lots of upload/download options and support for add-in modules. ZyXEL pulled all its NASes from the market at the end of February for undisclosed reasons, but just recently made them available again. Along with the renewed availability came the NAS326 2-Bay Personal Cloud Storage. The NAS326 is targeted at the entry-level market and it currently holds bragging rights for the least expensive 2-Bay RAID1 class NAS in our current NAS Charts. If you're thinking the product image above looks familiar, you're right. The case on the NAS326 is virtually identical to the NAS325 V2 Tim reviewed in early 2014. The NS325 V2 was an update of the original NAS325 I reviewed in October 2012. With the model number change to NAS326, the NAS has an updated Marvell processor and now features a desktop-style user interface found on most modern NASes along with support for downloadable packages that add to the device's functionality. The NAS326 has a 12-page Quick Start Guide that will help you with disk installation and get you connected to the NAS. On page 11, you'll find support phone numbers along with QR codes for downloading ZyXEL's mobile apps. There's also an exhaustive 372-page user manual, common to all of the ZyXEL NASes that details all of the features available. It's well worth a download and quick browse if you're considering purchasing this NAS. The image below shows the callouts for the NAS326 front and rear panel. It was taken from the NAS326 data sheet, which also includes detailed specifications. The table below shows the key for LED indicators. The image below shows the main board of the NAS326. The Marvell single-core Armada 38X 88F6810-A0 is near the center of the board. On the right is a card slot for the disk drive backplane. The 512 MB of Samsung DDR3 memory is soldered to the PCB and is not upgradeable. The board has neither heatsinks nor an RF can atop the main components. For this review, I decided to compare the NAS326 with the ASUSTOR AS1002T and Thecus N2810. Of the three products, only the NAS326 has a single core processor. While in the past we've reviewed many single core processor-based NASes, most of the more recent entries in the market have dual-core processors. If you filter the NAS Charts for RAID1, the default current testing methodology and sort by price, you'll see these three NASes are the least expensive RAID1 class products. I chose Thecus N2810 over the identically-priced QNAP TS-251, as the Thecus NAS was just reviewed in May, while the QNAP review dates back almost two years. The TS-251 is, however, still in the current QNAP product lineup. We'll see in the performance section of the review whether the single-core processor can keep up with the dual-cores. The image below shows Windows file copy write performance for the five least expensive 2-drive NASes. The table below summarizes the key components for the selected products. The NAS326 drew 11 W with two WD Red 1 TB (WD10EFRX) drives spun up and 6 W in power save mode. RAID 1 rebuild was immediate when the bad block check was skipped. Noise was rated as very low. 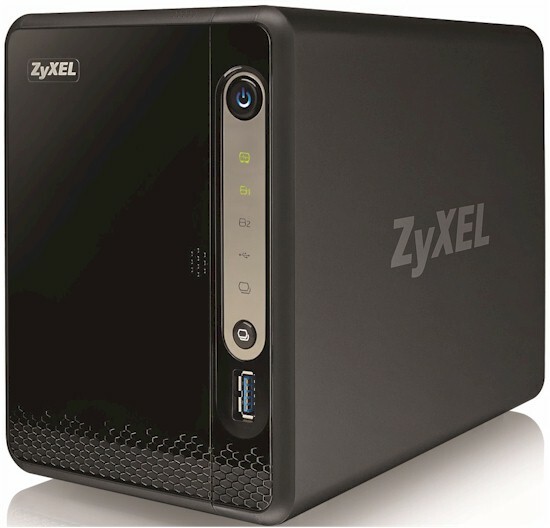 As noted in the introduction, the NAS326 ships with an updated version (5.1) of the ZyXEL NASOS. It features a new desktop-type user interface that is similar to what you'll find on competing products from Synology, QNAP, ASUSTOR and others. The image below shows the"desktop" landing page. The desktop metaphor doesn't carry into all the NAS326's features, however. You'll need to access the Administrator menu (top left menu bar item) to configure most of them as shown below. This menu will be familiar if you already have a ZyXEL NAS, since variations of it have formed the heart of all its NAS OSes. The new OS moves Storage setup into its own window that is launched via the Storage Manager desktop icon. You'll need to click on the Control Panel desktop icon and then into the TCP/IP submenu to get at key network settings. The NAS326 supports iSCSI targets, but connecting required help from ZyXEL support. CHAP authentication is required when setting up the iSCSI target on the NAS and an allowed initiator must also be specified. Windows' iSCSI initiator setup requires acessing its Advanced menu after connecting to the ZyXEL target. The settings shown below are examples. You'll need to enter the correct values for your network and NAS. There isn't a product emulator on the ZyXEL website, so I've included a short gallery to give you a feel for other features and the user interface. In all, ZyXEL gets points for trying to improve its admin UI. But you'll find yourself hunting around for functions among the desktop icon windows, which can't be resized, and old-school Administrator screen, which lanuches into its own browser tab.